*Space is limited to the first 50 women who register (12 and older). Based on 1 adult in a Wilderness Estate Suite. Rate does not include taxes and fees. $600/ a person, a night – Call 800-473-0601 or email theresort@pawsup.com for more information or to book this package. Cowgirl Honorees that will be joining us at Cowgirl Spring Roundup will include: master engraver Diane Scalese, artist Ashley Collins and photographer Barbara Van Cleve. 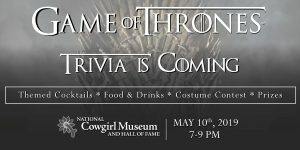 Game of Thrones Trivia Night is coming to the Cowgirl Museum! TICKETS ARE ON SALE. Click here to purchase your – tickets are limited http://bit.ly/2PbSmSz. Join us for Game of Thrones Trivia Night before the final episodes of season 8 of the HBO hit show. Admission cost includes beverages, featuring a Game of Thrones themed cocktail, snacks, and fun competition with fellow Game of Thrones fans. Come dressed as your favorite Game of Thrones character for our costume contest. Prizes will be awarded for trivia winners and the costume contest. Want to register a team of your friends? You can register up to 6 people for only $120. Teams can be 1 person – up to 6 people. If you’re purchasing an individual ticket(s), you MUST list below YOUR NAME and your team name OR the names of individuals that are on your team to make sure you are seated together. If you are a team of one, please put “Your Name, Team of 1”. The National Cowgirl Museum and Hall of Fame is proud to have Game of Thrones horse master, Camilla Naprous, as a Cowgirl Honoree. Did you know we have the saddle that was rode in by Kit Harington, who portrayed the character Jon Snow?! Plan to arrive at the Cowgirl Museum at 6:30 p.m. so you have plenty of time to get your food and drinks, as we start the trivia promptly at 7 p.m.
*NOTE: Please bring ID with you as this is a 21 years of age and older event. For questions or additional information call 817.336.4475 or our Facebook event http://bit.ly/2UyoUvY.